Partly cloudy early followed by mostly cloudy skies and a few showers later in the day. Thunder possible. High around 55F. Winds ESE at 10 to 20 mph. Chance of rain 40%..
We arrived late at camp, set back in a clearing a hundred yards off the gravel road. Earlier in the evening, flashes of lightning had lit up the night as we’d driven, and although stars now dusted the ink-black sky, the ground underfoot was freshly wet and heavy. The rush of the stream rose up from the darkness of the canyon below and, like the plumes of our breath, dissipated heavenward into the night. Bundled against the October chill, we sat opposite one another in camp chairs, a bottle of whiskey on the cooler that served as a table between us. I leaned back in my chair and, closing my eyes, inhaled as deeply as my lungs would allow, then with the exhale released into the universe the accumulated tension of the drive and the just-completed guiding season and that of life in general. I reached for the bottle, took a slug, then looked across at him. He took a slug himself, then blew a sharp burst of air across the top of the bottle, producing a shrill chirping sound that echoed off the nearby cliffs. “Agreed,” he replied, setting the bottle down. I listened further to the stream below, the only discernible sound in the otherwise still high country night, and imagined the next morning, sitting in this same chair as breakfast cooked and the sun worked its way down the surrounding mountains. I would break out a rod and carefully rig it, checking the leader for abrasions and tying on fresh tippet and selecting a fly as yet unknown. The further up the canyon one progressed, the narrower and more constricted it became. There will be scrambling under, over and across tangled deadfall, balancing on logs bleached with the seasons and fallen across the stream, wading pools hip deep or taking to higher ground to circumvent places otherwise impassable. Lastly, toward evening, I’ll come to that pool where, if my timing is right, the last of the day’s sunlight will be angling into the canyon through a narrow cleft in its walls. The pool will be bathed in a soft glow and perhaps there’ll be the remnants of the day’s last hatch upon and over the water – mayflies gently hovering, caddis busying and one last chance to take a fish feeding in the quiet water along the pool’s edge. No trail exists here for the hike out from here. Instead, with weary legs I’ll pick out the path of least resistance and mountain goat my way toward the canyon’s rim where near the top an overgrown two-track will lead back up to the gravel road, and I’ll walk the mile or more back to camp as the air chilled and the distant granite mountains radiate orange and purple in the dying of the day. I’ll sink into this same chair and listen to the sound of the stream as darkness falls once more and raise the bottle and salute the day just passed, and the next to come. 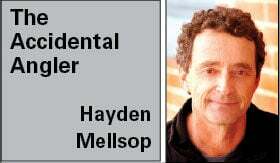 Hayden Mellsop is a Realtor with Pinon Real Estate Group and a former fishing guide.